Mystery readers everywhere, rejoice! This first of the Alafair Tucker mysteries introduces an engaging new heroine to treasure. Set during the cold winter of 1912 on the Oklahoma frontier, Alafair Tucker is a farm wife and mother of nine. She determines to discover the murderer of an abusinve neighbor, even when the clues point to his eldest son, who Alafair’s daughter Phoebe loves and who is hiding in one of the family’s outbuildings. The Oklahoma winter of 1912 is only a shade tougher than sleuthing farm wife Alafair Tucker. You’d blame well better be tough when you’ve got a husband and nine kids to do for on a farm only a few notches up from hardscrabble. On top of that, suppose you have reason to believe that one of your kids — maybe the gentlest and most innocent of the lot — is complicit in a murder. Seventeen-year-old Phoebe, her mother suddenly comes to realize, has fallen head over heels for John Lee Day, a troubled boy from the neighboring farm. What troubles John Lee most is his rascally father Harley, a bottom-feeder who abuses and exploits him. But now somebody’s done John Lee the favor of pumping a bullet into the old buzzard’s worthless skull. That someone could well have been young John Lee, tormented once too often, maybe aided and abetted by love-stricken Phoebe. Faced with a situation so full of dismal potential, what’s a mother to do but turn detective? Tough and durable, she’s also bright and quick and, like the English counterpart in whose tradition she takes a comfortable place, confident of the intuitive powers she flexes on the ample supply of Harley haters in nearby Boynton and environs. “[with} the writing, descriptions and dialogue evoking the turn-of-the-century frontier setting, it is good reading. The mystery, when finally solved, is completely unexpected…” [when it comes to the books recipes]… “I don’ know which is more mouth-watering: the novel or the food.” – Theodore Feit – “Dorothy L” e-group. It’s obvious Donis Casey has a deep love for Oklahoma.Â It’s also obvious that Casey — a former University of Oklahoma academic librarian — has a gift for plotting, is a natural born story teller and knows the Sooner state history well.Â Casey’s gifts afre evident in her first novel, The Old Buzzard had It Coming. Casey’s Alafair Tucker is a unique character with depth and intelligence.Â She’s strong, makes a mean peach pie and can gossip with the best of ’em …Full of energy, despite being the mother of a bunch of kids, Alafair is sorta’ of a red dirt Sherlock Holmes.Â She’s willing to follow a single strand of a clue until she discovers the end.Â And. because this tale involved her daughter Phoebe, Alafair is willing to do just about anything to protect her child… ” Norman Transcript, 2006. 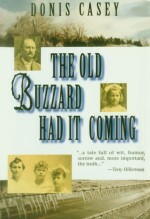 The Old Buzzard Had It Coming is set in a 1912 Oklahoma farming community. Donis Casey returns us to a time when family and community were respected and embraced. In this, the first of the Alafair Tucker Series, we are introduced to Alafair and Shaw Tucker, along with their nine children.